With the long holiday weekend drawing near, what better way to kick back and relax than with this refreshing take on lemonade. I begin by making a sugar syrup (two cups of sugar and one cup of water brought to a simmer), to which I added several sprigs of fresh mint, and about two inches of peeled fresh ginger. I let the syrup steep for ten minutes and then strained it. Start by filling each glass with ice (I also rimmed mine by dipping each into lemon juice, and then into granulated sugar, which adds a festive touch), a few lemon slices, and several torn mint leaves. 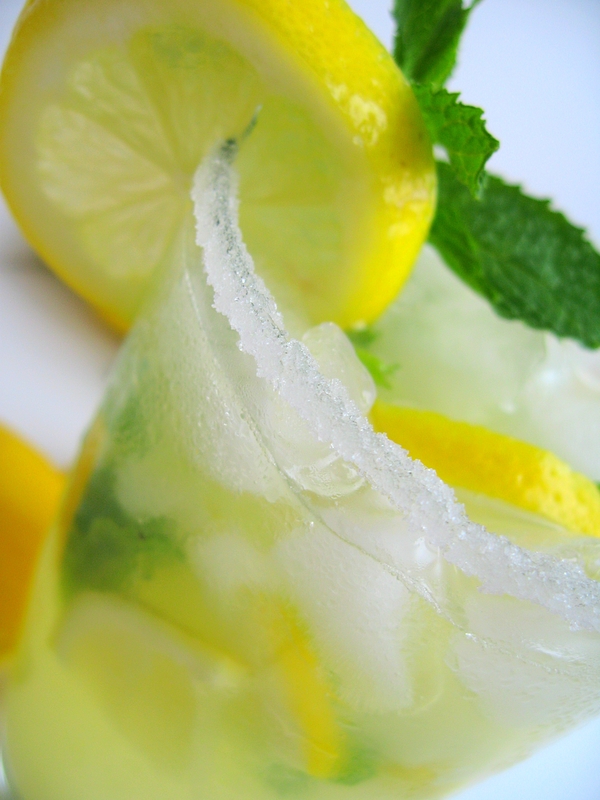 Add one part freshly squeezed lemon juice, one part sugar syrup (or to taste), and four parts club soda. 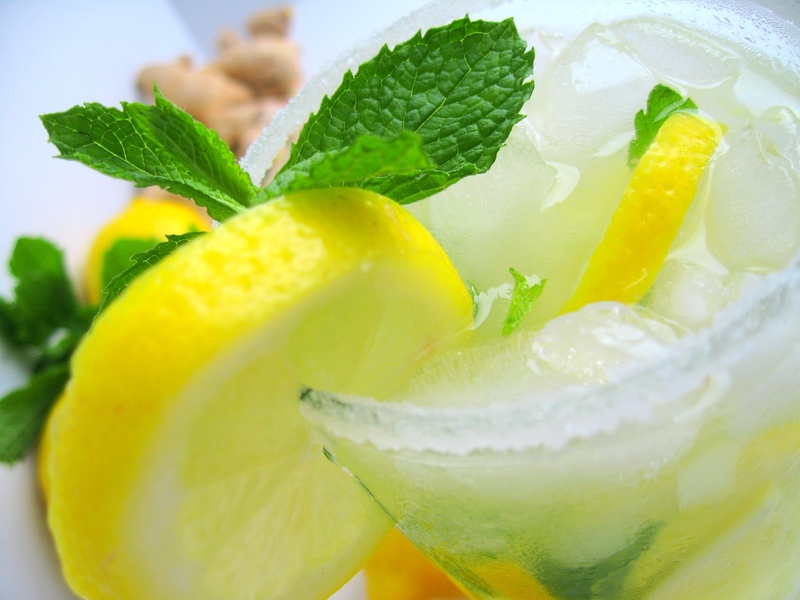 This lemonade is sweet, tart, and refreshing. For an added kick, add a splash of your favorite vodka, and you have a delicious cocktail, perfect for any fourth of July barbecue. Enjoy! Not only refreshing, but delicious. And, I think that little addition of vodka would be divine! Happy 4th. So refreshing! I love the idea of putting sugar on the rim of the glass. Thanks! I’ve got loads of mint growing in my garden, too, so I’m always on the lookout for ways to use it up. Right on time for the holiday weekend. Great pics! 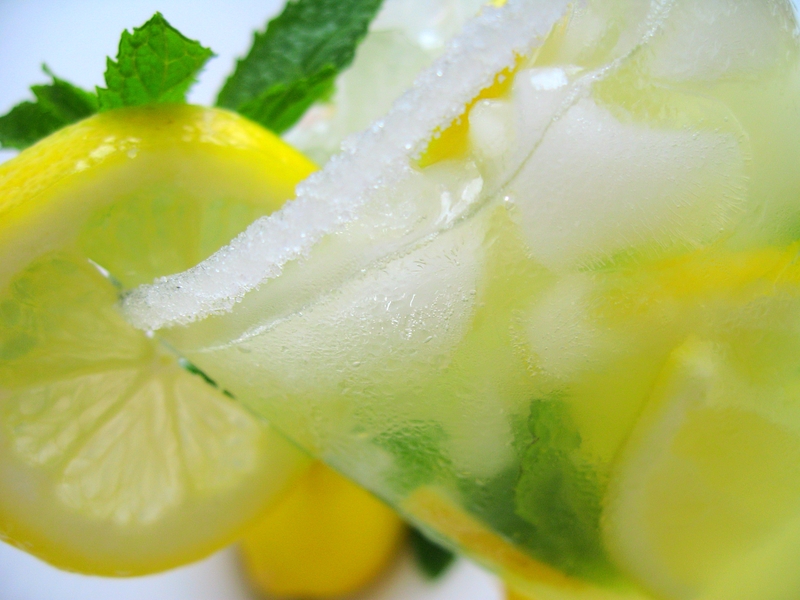 I made fresh lemonade for a party a few years ago that was spiked with vodka… it was a hit. Going to have to try this out for the next BBQ we have. Oh my! This looks delicious, and completely refreshing! 🙂 Definitely going to try this soon. Looks refreshing and delicious. Great photos. Absolutely brilliant! Gorgeous drink and wouldn’t you know it, lemon and ginger just happen to be two of my very favourite flavourings! I have a ton of mint in my backyard and have been wanting to make ginger lemonade, didn’t think of adding mint. I’ll have to try it!